This program reminds you about unanswered phone calls,or received but unread text messages. It plays special voice announces several times,with the number of lost events,afterward you've missed something. because it does not display any special interface while running. Have you been ever wondering, why Microsoft lost such mode in their phones? 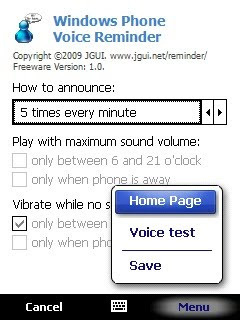 In the selected mode (Settings dialog),it plays a special voice announce with the number of your missed events. You can break such notification, when you review Calls History, or read all messages in Inbox. Additionally, this program reacts depending on the distance how far the phone is from you. This function is running only in some newest phone devices,like Samsung Omnia, where distance is recognized out of 5-10 centimeters.